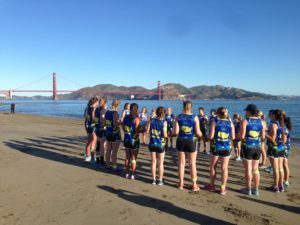 Each year Ulman Cancer Fund identifies various service, education, mission engagement, and scholarship opportunities leading up to and during the 4K for Cancer journey. 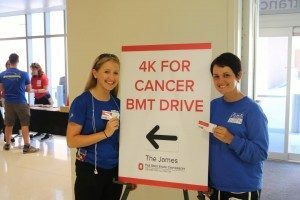 These opportunities give the 4K for Cancer participants the opportunity to learn more about the young adult cancer cause, raise awareness, and engage with and support patients, families, communities, doctors, nurses, and researchers that have been impacted by, or are having an impact on, young adult cancer. Each team will award two higher education scholarships during their trips. The scholarships are named in honor of Jamie Roberts and John Hanley. 4K Participants will serve as scholarship readers and scorers. Ulman staff will work with the scholarship recipient to organize a scholarship presentation. The scholarship event could also be combined with a Bone Marrow Drive or Cancer Center Visit. The event could be at a sporting event, an outdoor picnic, or a community gathering potluck. 4K for Cancer participants will have opportunities to visit hospitals to meet with patients, families, and hospital staff along their routes. During hospitals visits, 4K for Cancer participants have brought meals to patients, held sing-a-longs in the hospital, led games or activities, and shared the 4K for Cancer story with patients and families. Blood cancers (such as Leukemia) are commonly seen in the young adult oncology population. 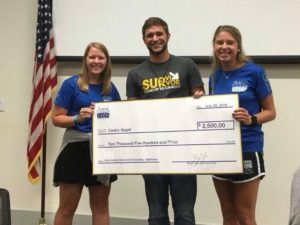 The Ulman Cancer Fund partners with There Goes My Hero and Delete Blood Cancer to hold bone marrow registry drives with the goal of adding more people and increasing chances of these matches. The 4K for Cancer is in the unique position to hold these drives in communities through which they travel, and help There Goes My Hero reach new populations and swab more people. 4K for Cancer participants will provide hope and inspiration to communities across the country who have been impacted by cancer. Participants may attend community dinners, chat with hosts, or present on the 4K for Cancer program to spread awareness and create a community of support. Courage Kits contain items such as blankets, back scratchers, hand lotion, toiletries, and puzzle books to make long hours at the hospital a little easier for young adult patients and families. 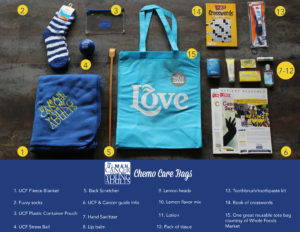 They contain items that young adult cancer survivors have deemed “essential” to have while in the hospital. The 4K for Cancer teams will assemble and deliver kits to hospitals along their routes. 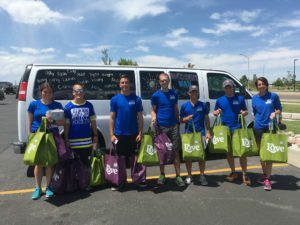 Ulman staff will collect written stories from the young adult cancer community to provide inspiration to 4K for Cancer participants while on their journey. Their stories will be read throughout the trip and they will become an honorary teammate for the day on the 4K for all of the trips. Postcards will be sent to each honorary teammate from the different teams. 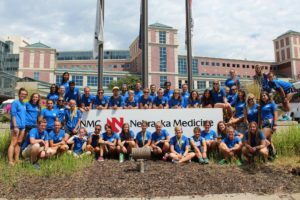 This education opportunity provides 4K for Cancer participants with the ability to tour large academic cancer centers, other community organizations, or pharmaceutical or genetics labs to learn more about the young adult cancer experience, support services for young adults, or developments in cancer treatments that affect young adults. Participants have the opportunity to speak with doctors, nurses, and advocates in the young adult oncology field, as well as researchers who are making strides developing new and innovative treatment and detection methods.